Farming beef cattle in the UK takes several forms and the route chosen by producers is dominated by location and individual circumstances. Pedigree suckler herds can be very profitable where there is an established demand for top quality breeding animals. It favours those with an intimate knowledge of both the breed and the market and can, because of significantly better margins, be a successful business model for smaller farms. Single suckler herds predominate on beef-only farms. Where there are also dairy animals, in-milk, multi-suckler cows of the dairy breed are used to rear several calves in addition to their own, to allow the calves' mothers to remain in the milking group. In suckler herds, virtually all the progeny are reared for meat. The third category is the beef finishers; farmers who buy store cattle in the market for fattening to slaughter. This category favours the farmer who may not have the buildings for over-wintering, but whose modus operandi allows him to turn ‘stores’ into fat cattle for market. There is more competition in the beef industry these days because of the large number of ex-dairymen who have turned to beef as a means of staying in business. As in the dairy industry, it means that to succeed and make a profit, beef farmers have to produce efficiently and this efficiency is not just administrative, it means re-profiling the whole operation. With rising labour and feed costs, it pays to concentrate on hardy, placid, thrifty animals with an excellent feed conversion ratio, good milk and good mothering qualities. If enough land is available they should be native, grass eating breeds. At a stroke, there is a saving on bought-in feed, less labour is needed to handle them and you don't need deer fences to keep them on the property. If local native breeds are used, they have the further advantage of being bred to the land and will do better than cattle from further afield, provided they are commercially viable. 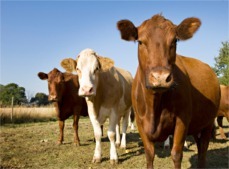 Field Science has wide experience of beef cattle, having worked with farmers the length and breadth of Great Britain. There are significant improvements in fertility, disease resistance, growth rate and general ‘thrift’ of animals grazing re-mineralised land. The tailor-made trace element dressings are designed to restore the nutrient levels in the soil’s rootzone, ensuring that the grass plants can acquire the correct balance as and when required. This occurs through the soil as Nature intended rather than through mineral buckets, drenches and other ‘sticking plasters,’ thereby optimising the nutrition of the cattle. Obviously, if the land is perfect, there is nothing we can do, but in our experience less than 5% of UK pastures fall into that category!